JP 2007-03-20 600 points ? US 2007-08-06 ? points ? EU 2007-08-10 ? points ? AU 2007-08-17 ? points ? JP (Download) 2011-03-17 ¥? ? 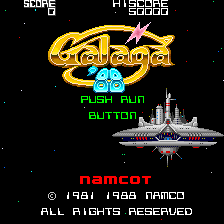 Galaga '88 (ギャラガ'88) is an entry in the Galaxian/Galaga series of shoot-'em-ups by Namco. This particular entry has seen its name change several times - it was originally released in arcades in 1988 as Galaga '88 before being brought to the PC Engine later in the year, but was later re-titled Galaga '90 when brought to the TurboGrafx-16. It was later re-released on other systems as Galaga '91. Main article: Galaga '88/Magazine articles. Sega Retro has more information related to Galaga '91. This page was last modified on 5 January 2019, at 10:16.